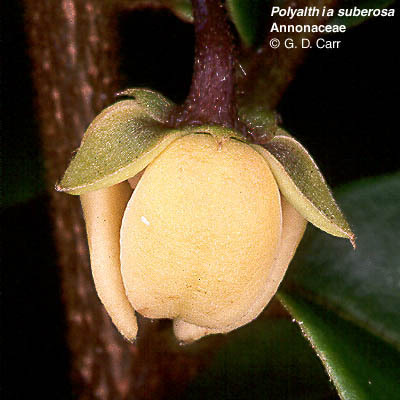 Polyalthia suberosa, Annonaceae, polyalthia. 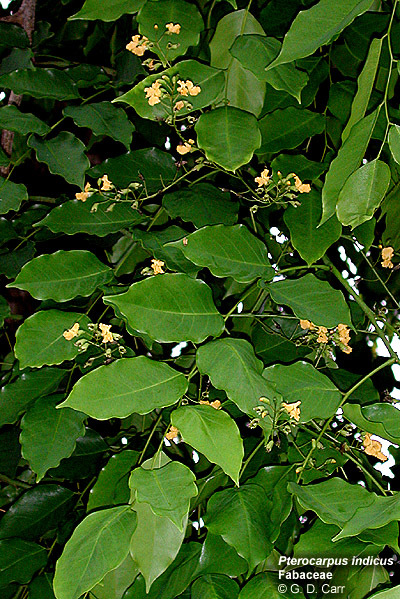 Twiggy bush or small tree from India with small (about 1/3 inch in diameter) solitary pale yellow 3-parted flowers, from each of which develop cluster of several more or less edible round, purplish fruits each about a quarter of an inch in diameter. 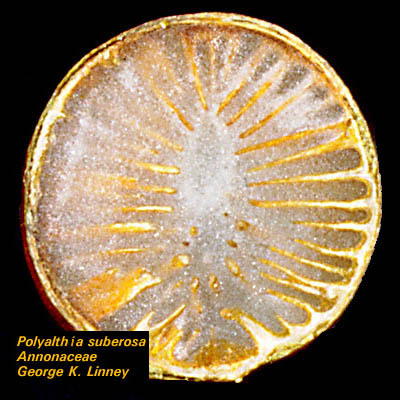 The endosperm of the seed is ruminate (divided into small compartments or channels) . 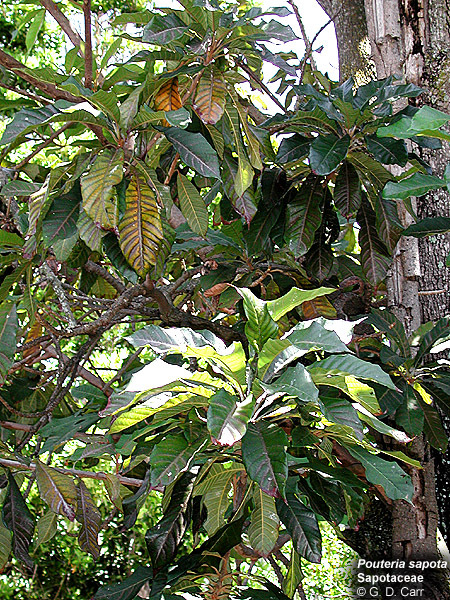 Polyscias guilfoylei, Araliaceae, panax. 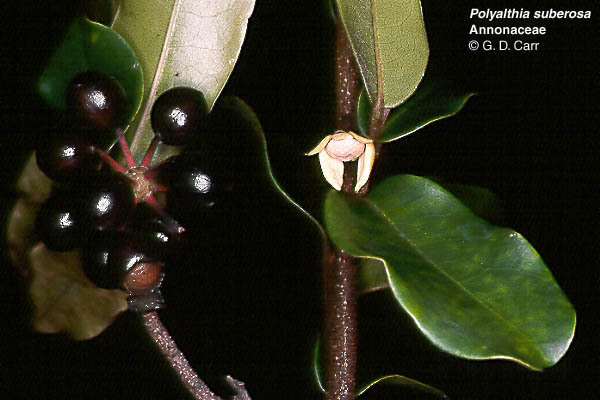 Common hedge plant from S. Polynesia, rarely flowers in Hawaii. Location: Miller Hall; Diamond Head of Hawaii Hall; Diamond Head side of Andrews Amphitheater. 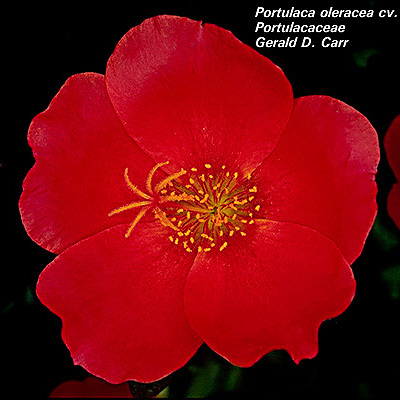 Portulaca oleracea, Portulacaceae, purslane, pig weed, akulikuli-kula. Widespread herbaceous weed of uncertain origin, introduced to England in 1582, was in the New World when Columbus arrived. 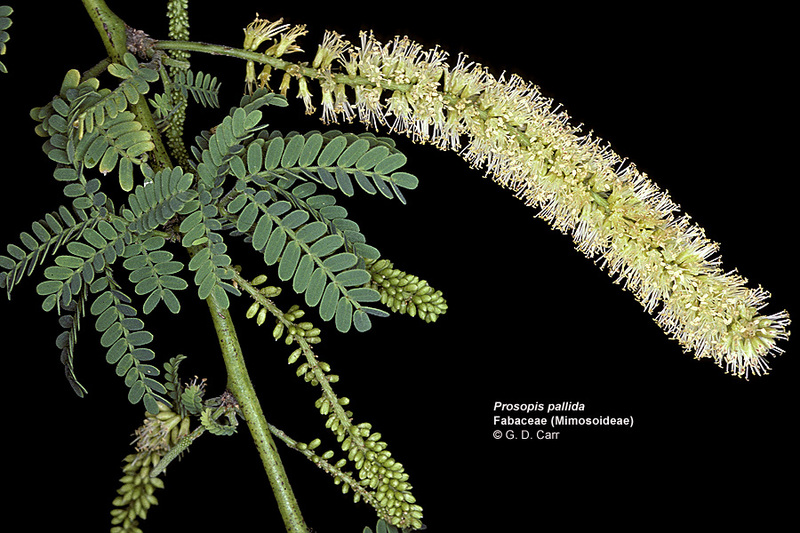 Cooked and eaten in many countries, used as a pot herb and for medicine for hundreds of years. 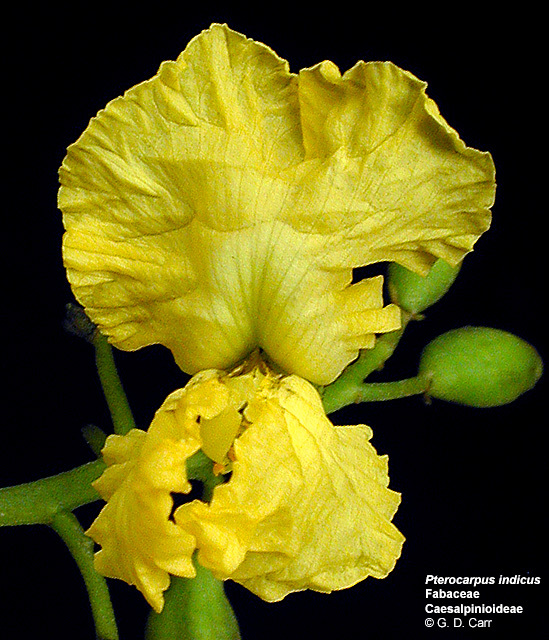 The weedy form has small yellow flowers but a commercial cultivar with larger flowers of various colors is also commonly planted in Hawaii. Location: Very common on campus, waste places, flower beds. 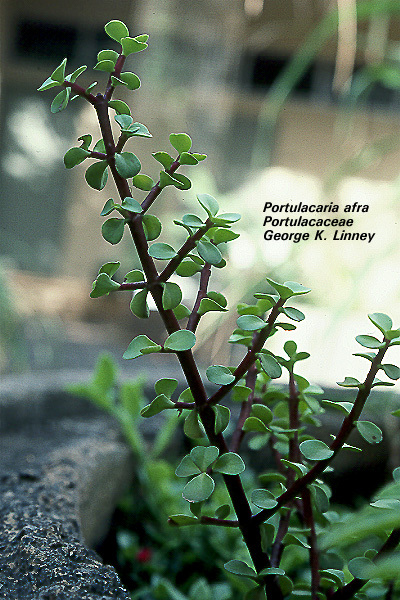 Portulacaria afra, Portulacaceae, purslane tree, jade tree. 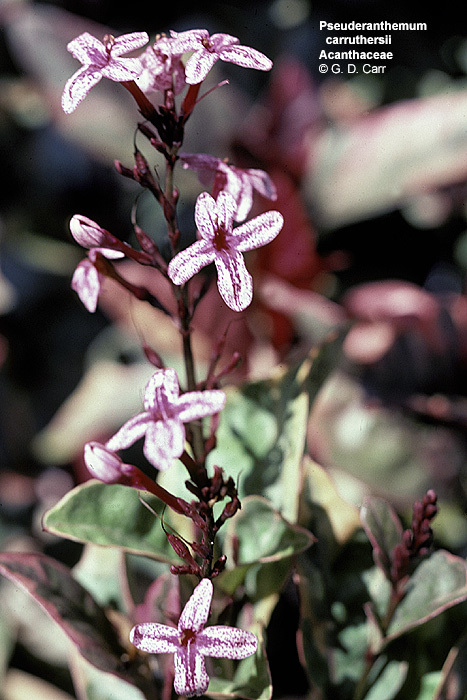 Succulent ornamental shrub, native to South Africa, generally does not flower in Hawaii. Location: George Hall courtyard. 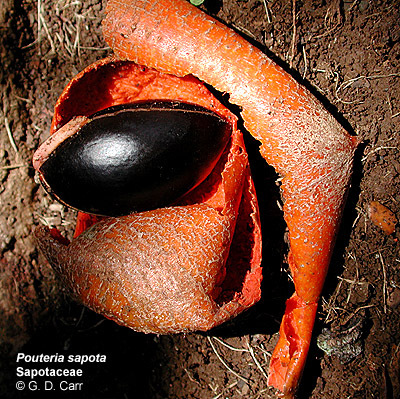 Pouteria sapota, Sapotaceae, mamey sapote, marmalade fruit. 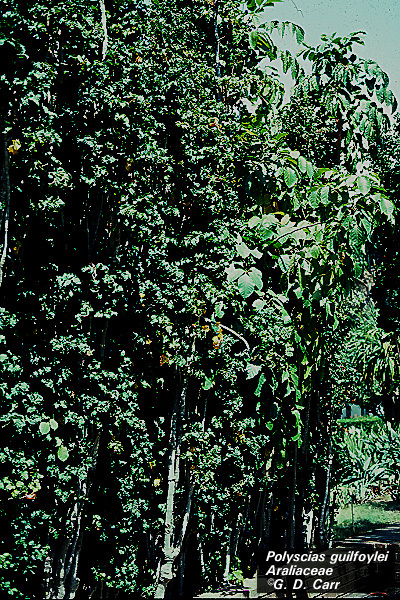 Central American tree with milky sap and large, orange, egg-shaped fruits with sweet edible pulp; eaten raw or made into marmalade, jelly, sherbets, and ice cream. 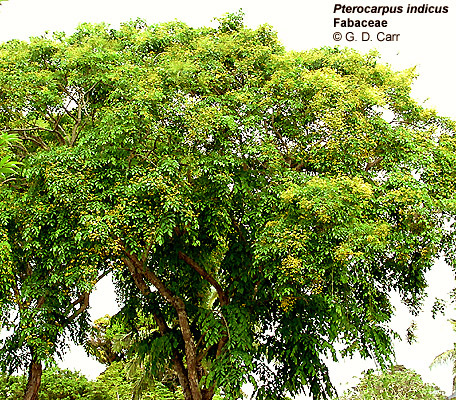 Oil from the reportedly poisonous seeds were used by the Aztecs for hair dressing and medicine. Location: Henke Hall, Ewa court. 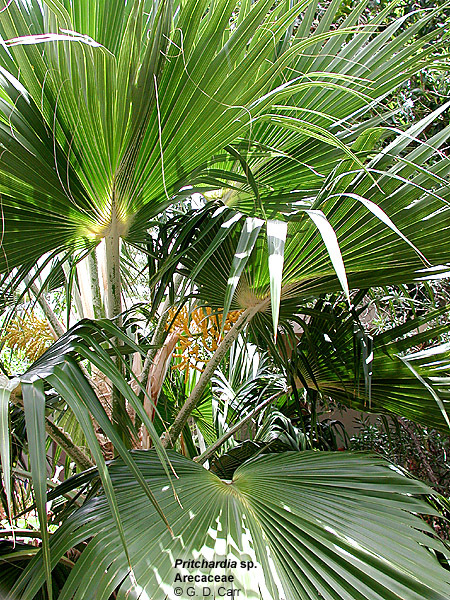 Pritchardia sp., Arecaceae, loulu. 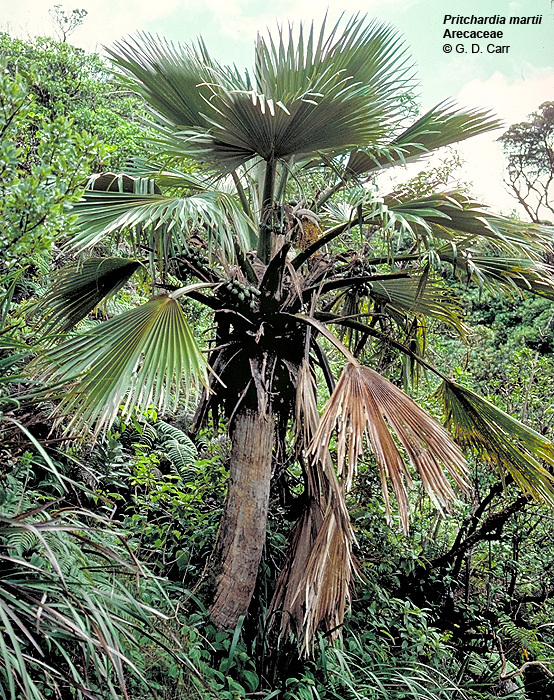 A tropical Pacific genus of fan palms with several rare species endemic to the Hawaiian Islands. Location: St. John courtyard (P. remota); Makai-Diamond Head of Diamond Head steps of Hawaii Hall (P. arecina). 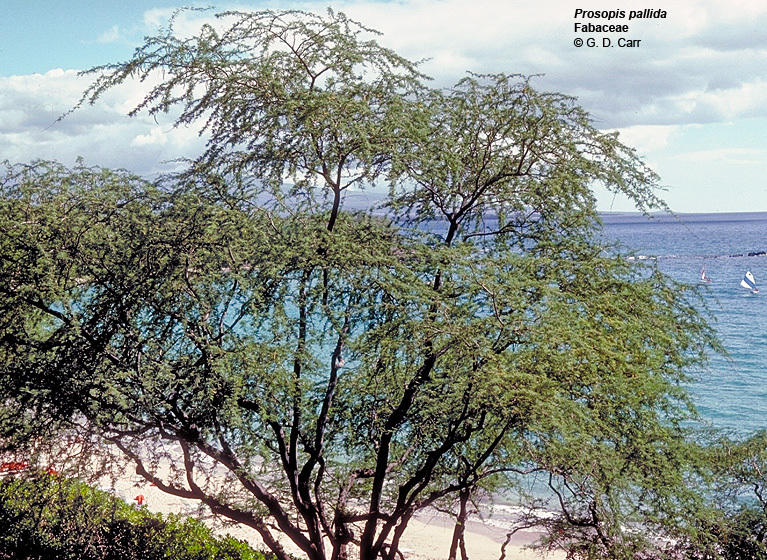 Prosopis pallida, Mimosaceae, kiawe, algaroba, mesquite. 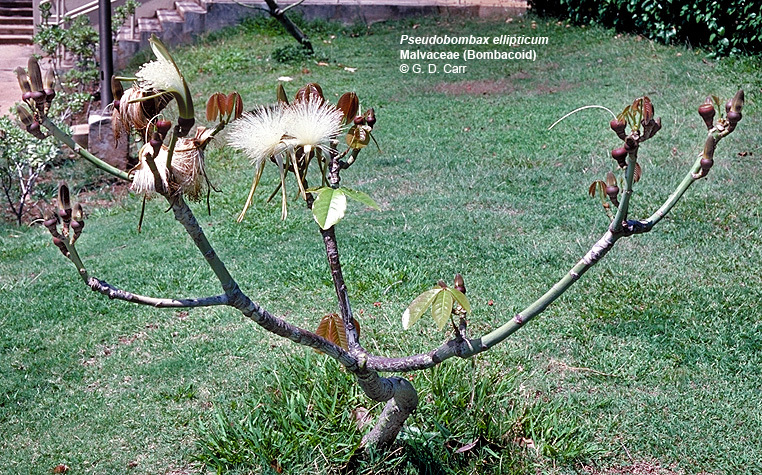 Large tree from Peru, with sinewy, contorted trunk and branches. 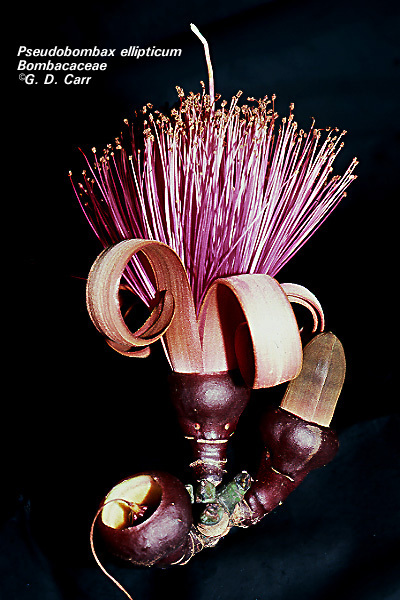 Flowers used in honey production; pods used for fodder; wood used for fuel and "premium" charcoal. Location: Parking Lot 6, between Auxiliary Services and Korean Studies Center. Pseuderanthemum carruthersii, Acanthaceae, purple false eranthemum. 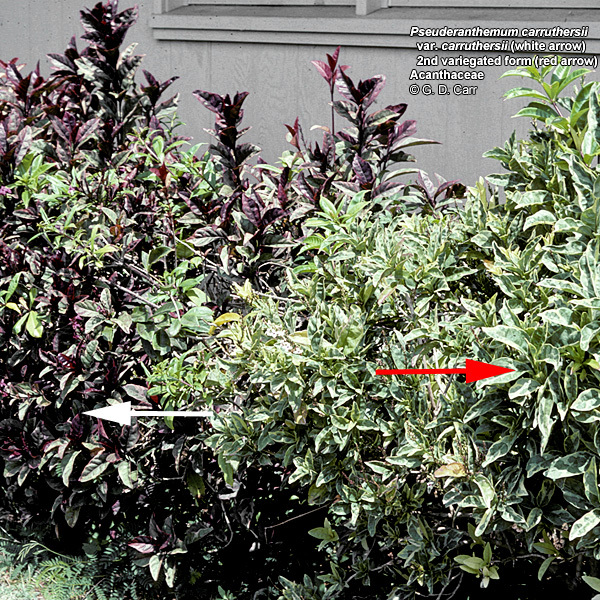 Smooth shrub from S. Polynesia, with rose-purple or white and purple flowers; leaves variegated with purple or green and white. Location: Makai of Bachman Annex 6; Makai of Eng. Quad. ; Diamond Head of Moore. 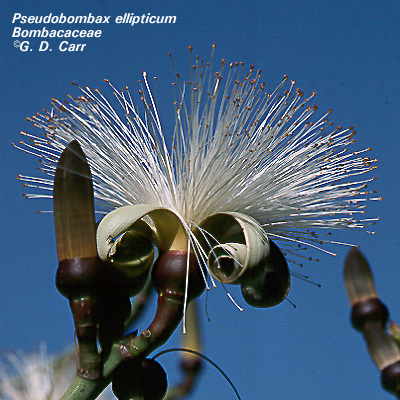 Pseudobombax ellipticum, Bombacaceae, bombax. 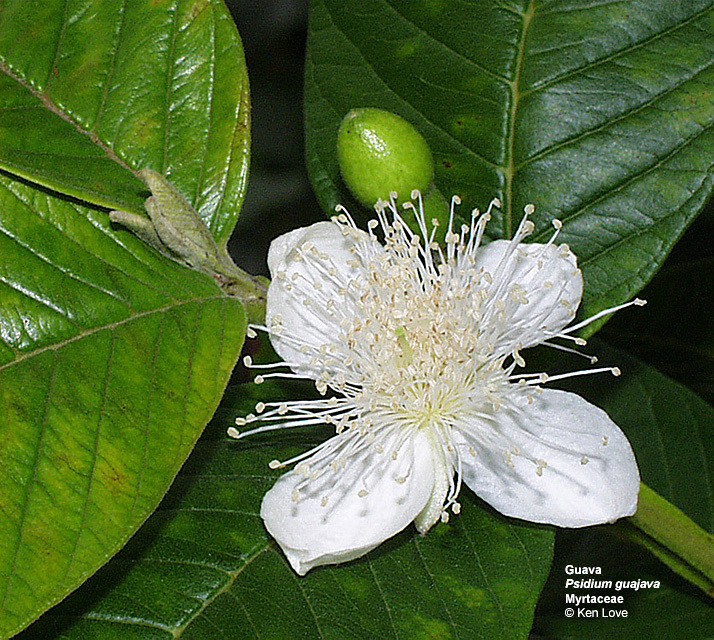 Tree from tropical America with showy flowers having conspicuous pink or white stamens, often flowering when the tree is bare. Location: Mauka of Sinclair; on Diamond Head side of walk Ewa of Henke. 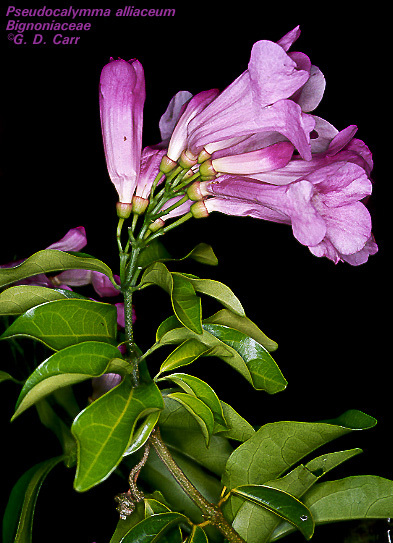 Pseudocalymna alliaceum, Bignoniaceae, garlic vine. 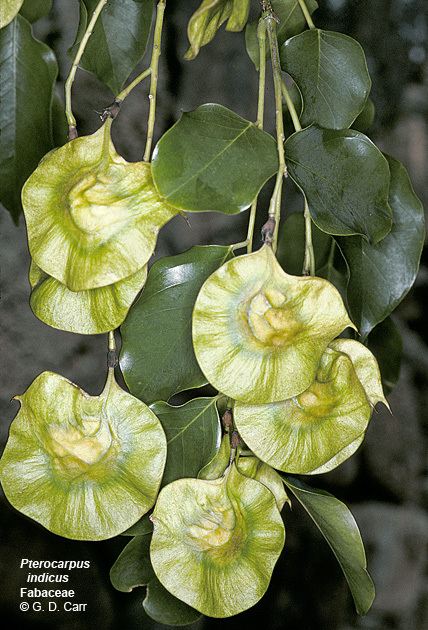 Ornamental vine from the Guianas and Brazil. 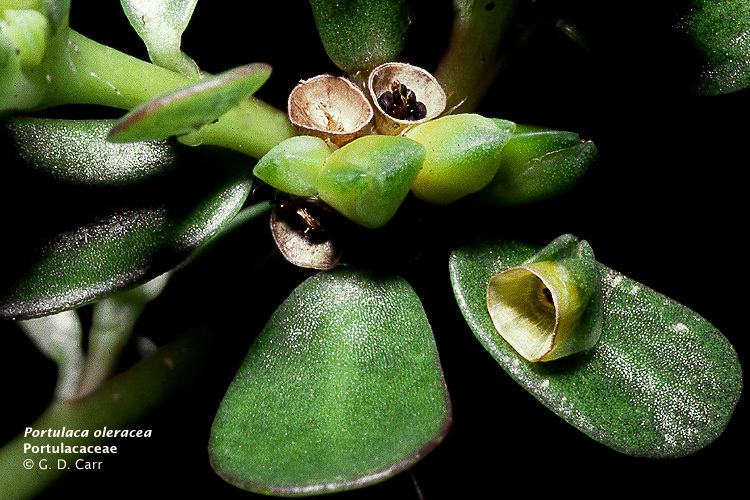 Each leaf is divided into two leaflets; the flowers are funnel-shaped and purple to pale lavender, about 3 inches long. 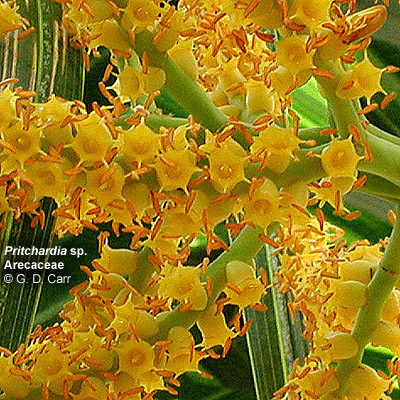 The foliage emits a strong odor of garlic when crushed. Location: St. John courtyard. 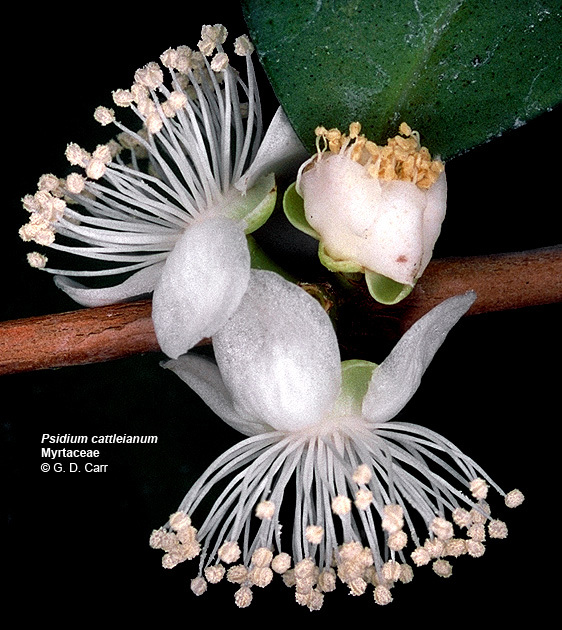 Psidium cattleianum, Myrtaceae, strawberry guava. 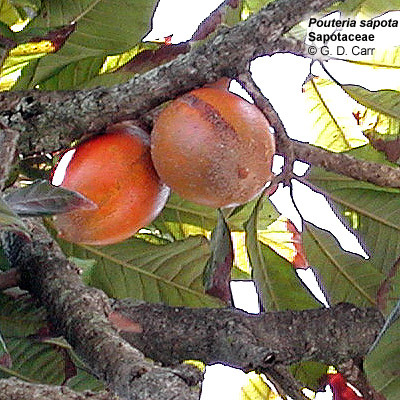 Tree from Brazil with purplish-red fruit about 2.5 cm in diameter, with white pulp, eaten raw or made into jam or jellies, tasting somewhat like strawberries. 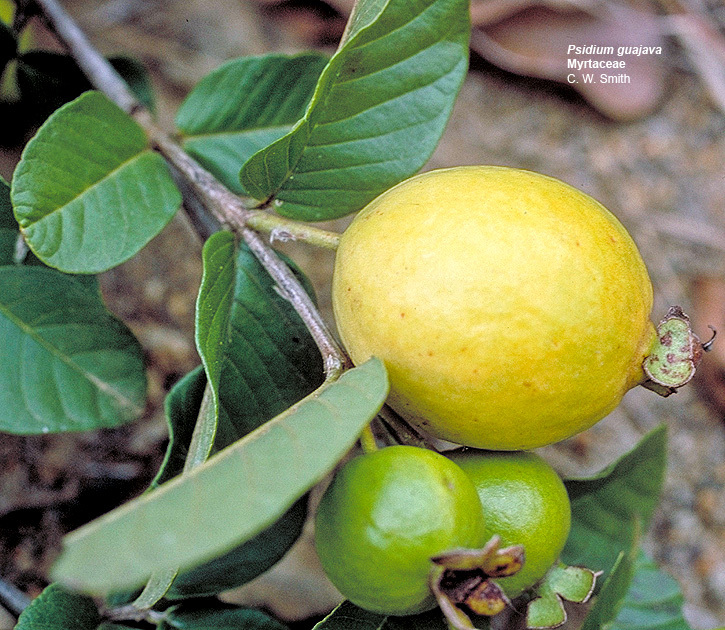 Another variety has larger, yellow fruits. 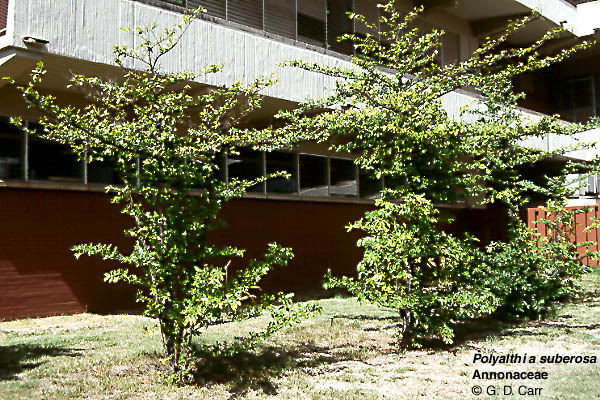 Location: Between Hamilton and Snack Bar; near mauka end of Japanese garden, behind Jefferson Hall. 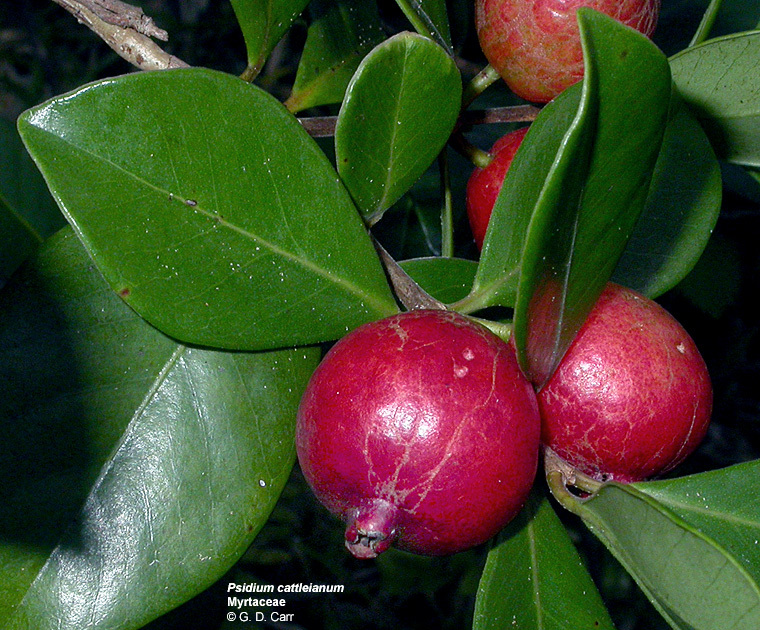 Psidium guajava, Myrtaceae, guava. 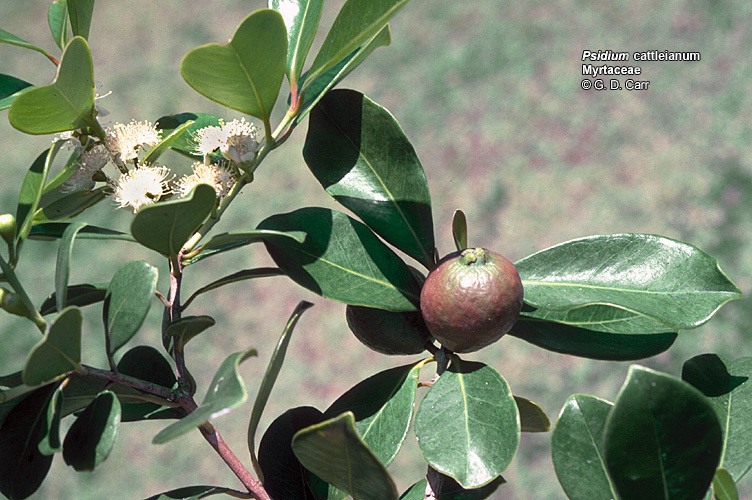 Shrub or tree from tropical America, with yellow or brownish lemon-shaped and sized fruit, pink or cream colored inside. Used for jam, jelly and juice. 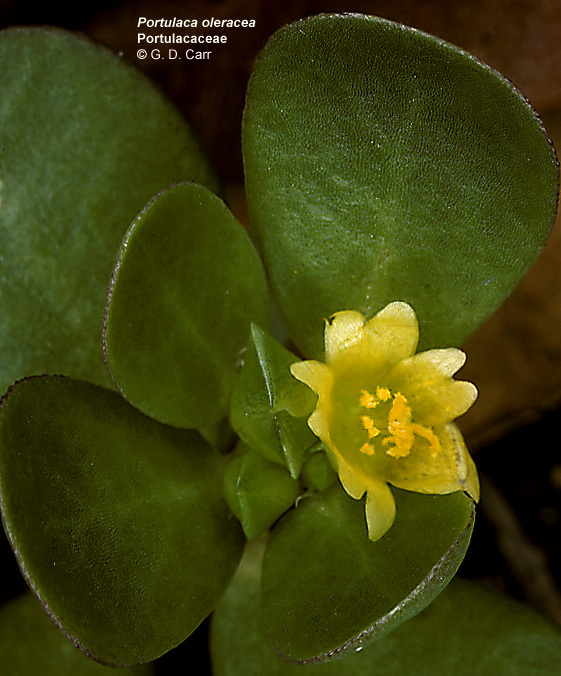 Introduced by Don Marin before 1825, now naturalized and common. Location: Ewa court of Henke; Makai end of EWS Japanese Garden. 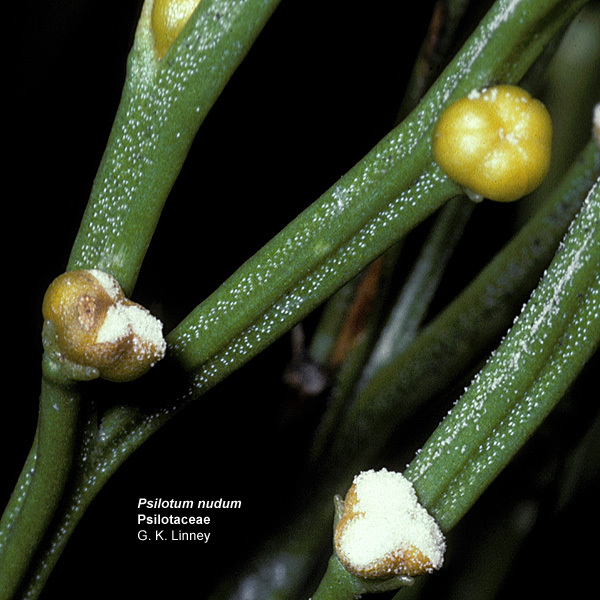 Psilotum nudum, Psilotaceae, moa, whisk fern. 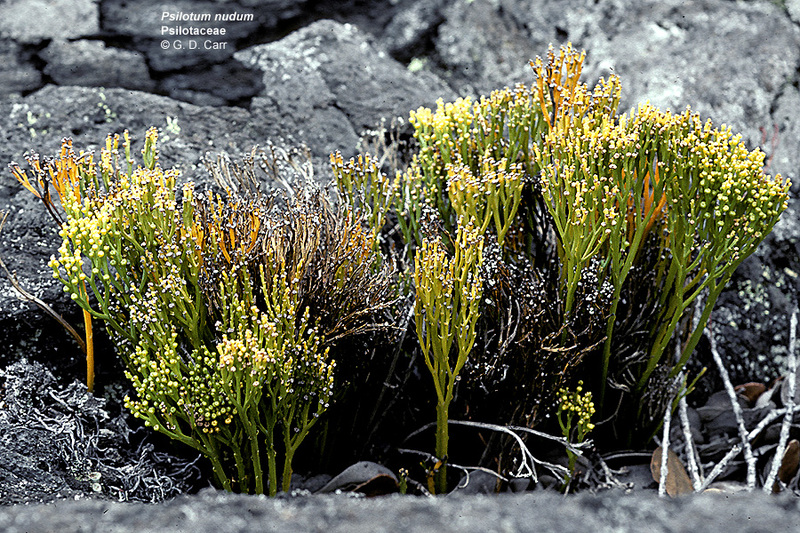 Rootless, leafless, dichotomously branching plant forming low-growing clumps; native to Hawaii and widespread in the tropics. 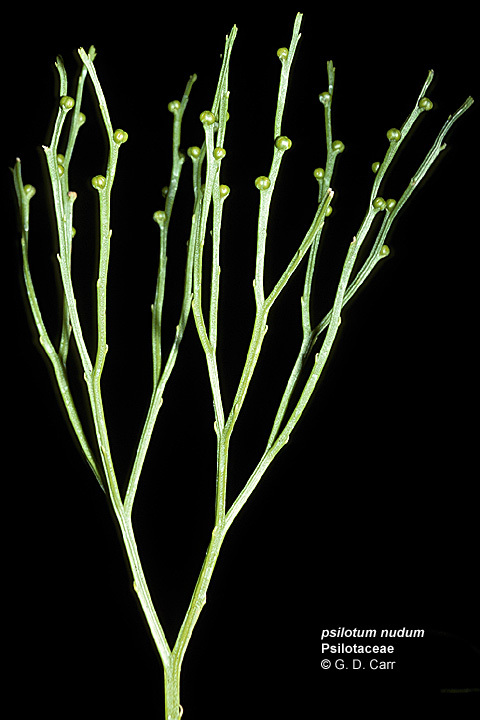 The plant produces abundant spores in globose sporangia about 1/8 inch in diameter, these borne along the edges of the wiry, angular stems. 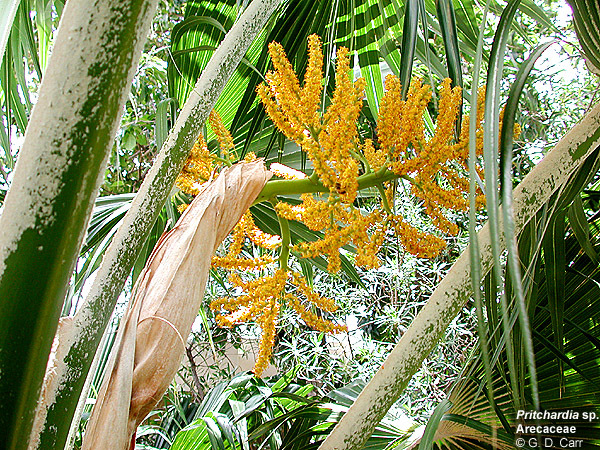 The spores were collected and used by the Hawaiians in a manner similar to talcum powder. Location: St. John courtyard. 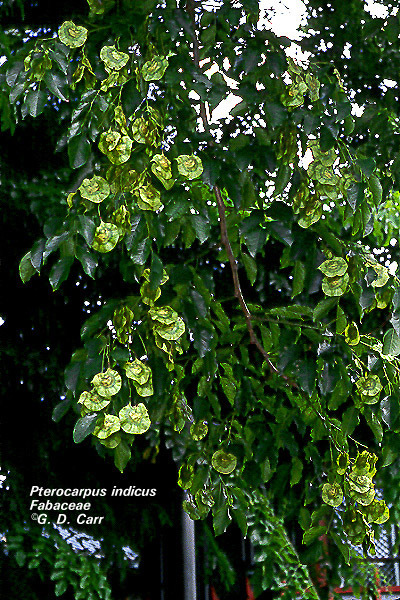 Pterocarpus indicus, Fabaceae, narra, Burmese rosewood. 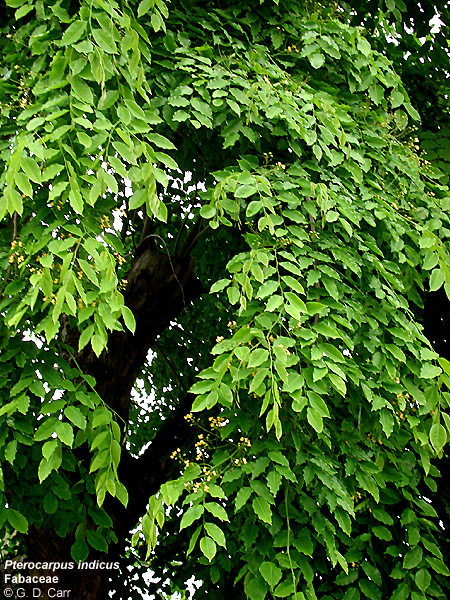 Large tree from S. E. Asia with clusters of fragrant yellow flowers; fruit very distinctive, about 2 inches in diameter, compressed, with a wavy, more or less circular, winged border bearing a short point about half way between the stem and the apex. The durable wood is red with black stripes and is highly prized for cabinetwork and furniture. Location: Ewa end of Holmes.